Subtle and atmospheric minimal ambient by the Hypnos founder. Close your eyes. . .
"Top 25 releases of 1997." "Well-thought out drone structures which pull the listener into a pool of rich harmonies and atmosphere dynamics." "Suddenly everything is dark, a void that stretches forever without light or identity. With these electronic excursions, Griffin explores various states of darkness. From the sedate "The Sound of Ringing Sleep" to the airiness of "Floating Rain" to the denser confines of "Immobile," the music displays a brooding quality. This brooding is not organic in nature though, instead exhibiting the stoic lassitude of inanimate matter. The compositions are generally compact, with only two pieces taking extended duration to examine the unnerving tranquillity of darkness. During the 19-minute span of "Displace," the soundscapes are given the freedom to breath slowly, evolving a sense of relaxed density from the minimal tones. As a brief vocal incidence softly declares: "In all this darkness, we're almost invisible." This defines the music on this CD: sonic visions of negation and the aspects which the human mind chooses to fill such tangible voids." "It's a must! I think that is your unrepeatable masterpiece. Listeners can play it many and many times without being never tired of it. I seems to find in this splendid work traces of musicotherapy and feelings of a serious research on neurological effects of sound on human brain. I'm very pleased of it. Compliments." "Griffin's own Sudden Dark is indicative of the label's high caliber. Multicolored waves of electronics gust and billow across stark, forbidden landscapes; sonic blips sometimes appear on the horizon and form disturbing cyclic eddies ("Gyre") while on "Atmosphera," tones that resemble the gradual erosion of heavy metals seep into great aquifers of liquid nitrogen. Griffin's pieces in fact suggest various sorts of placid states and environments ("The Sound of Ringing Sleep," "Immobile," "Displace," "Almost Invisible"), and the closing of one's eyes during the immersion in these environments greatly aid in the actualization of the pieces' titles. Subtle and superfine. " "Totally cosmic space music that really drifts through tracks from one to nineteen minutes long. The feel is of deep, haunting, emotional sound sculptures traveling slowly through the universe, all very dark and spacy." "Constructed over two years of sonic experimentation, the debut album from Hypnos label founder M Griffin is a work of dark, yet spacious ambience of a highly visual and meditative nature. Its slowly unfolding atmospheres bracketed by short spoken-word pieces, Sudden Dark is a strong artistic and philosophical statement. Opening with "Chroma," Griffin exhorts the listener to "close your eyes," encouraging a full immersion into the sound-pool he is about to create. Meandering through the calm, peaceful realms of "The Sound of Ringing Sleep" and "Floating Rain," one reaches the high point of the album, "Immoble." Shifting, moaning textures float over a slow, repeated pattern of bass tones for a poignant seven minutes. After the spoken-word interlude of "Almost Invisible," "Displace" takes the listener on a 19-minute stratospheric journey. At this point, things get a bit more abstract. "Gyre" consists of inharmonic, pulsing tones in complex rhythms, while "Escape/Approach" is an equally busy melange of disturbing sound. Finally, the listener returns to the stars for "Atmosphera" before "Unfinished" leaves the album with a distinctly open-ended conclusion. On the surface, much of this music seems similar. However, upon closer listening, one finds that Griffin has created very nuanced, original pieces. Sudden Dark is music for focused listening and mental stimulation." "M. Griffin creates music of an "ambient minimalism" base. The ten tracks on his debut CD, Sudden Dark, are smooth and methodical, peeled off the insides of eyelids the moment sleep overtakes, precarious seconds before the onslaught of dreams. These are sonic observations recorded from a pier at the edge of the infinite ocean (be it sea or space), the electronic inflections emphasizing the hollow; occasional spoken passages add to the overall emptiness found here. "Displace" is a massive 19 minutes that soars and hovers, but never lands; "Gyre" is more energetic, infra-bass supplying a kinetic edge; "Immobile" swirls with life and yet embraces like a cocoon--impetus subsumed. M. Griffin takes us on an out-of-body ride via an inner mindscape bridge constructed to explore all of the depth and space at hand. Cosmic (...or not?). On Hypnos, a new label out of Portland off to a good start with this fascinating venture." "From Hypnos - Portland's foremost purveyors of True Ambient - a new album just in time to counterbalance the coming Xmas rush. For this music isnÂ´t in a hurry to get anywhere - itÂ´s already there. One half of Viridian Sun, M. GriffinÂ´s solo turns from the solar noise and now plunges the listener into the _Sudden Dark_. Apparently, it shimmers like the Aurora Borealis draping itself undulatingly across the pitch-black Northern sky on cold winter nights. GriffinÂ´s solo album is the work of a composer fully in control of his tools. Otherworldly without having to resort to pyrotechnics, it is a masterpiece of restraint. Minimalist ambient in the best sense of the term. Gorgeous packing as usual, too." "Deep and dark space at its electronic best.... primo late-night drift listening, especially when you want it a little more dark than usual space music." "Suspended in a thick liquid, flecks of colour, dark in hue. A melody that never quite appears. Subtleties of sound. A dark stillness. Great listening in the late evenings, or maybe in the heavy midday heat..."
"Be prepared to take one hell of a trip through the darkest, farthest reaches of deep cosmic space, get the feel of this CD's haunting ethereal quality and then drift slowly off into the universe." "The nebulous mystery of darkness is a source of inspiration for some... M. Griffin, for instance. With the celestial evernight as his muse, and modern electronics as his voice, he conjures a vast, dream-like world of blackness with his 1997 solo release, Sudden Dark. Is it the hypnotic soundtrack to a science fiction journey, or freeform accompaniment to your darkest dreams? Or does it even matter? Whether it's outer space, or the space between your ears, Griffin's world is a sublime place to be lost in... a dark space built of beatless ambience. A 59-second mini-piece, chroma (close your eyes), serves as the doorway. A resonating wave and distant, distorted vocal fragments fade into silence which becomes... the sound of ringing sleep. As with all of the tracks on Sudden Dark, heavily processed layers of slowly mutating frequencies hover in a dense cloud. Long tones shift independently, their sonic tendrils interweaving with others to create a lush otherworld of sound. More minimal, floating rain's background is a barely perceptible rumble over which occasional slightly-more-musical passages and ghostly hisses slip. In a similar vein, immobile quietly drones along in a contemplative state of almost-suspended animation. The beauty lies in the subtle variations of the different elements. Vocal snippets in the haze differentiate the next (short) track; "In all this darkness, we're... almost invisible". At more than 19 minutes, displace is the marathon session of the disc. Again based in sound-strata, recurring whooshes suggest distant movement while other layers hum more statically. Perhaps we're in stasis, while other worlds move on? A beautifully "spacey" piece nonetheless, immersive and atmospheric in its length and breadth. Another relatively long track, gyre's most notable difference is a strange, incessant burbling. Low and high notes seem to randomly oscillate in muffled bleeps for 13 minutes. The mix mellows toward the end, and it's not uninteresting, but personally, I find this track a bit discordant. escape/approach is slowly engulfed in a vaporous, roaring void, with high frequency tinges and tinklings inside. Louder waves begin to ring across this space, filling it with an unknown resonance. Another deep-space dweller, atmosphera is chiming with dense sonic waves. A vast hollow sound of almost symphonic nature, this track swirls like clouds circling in a stellar vortex. unfinished closes the disc, again accenting the abstract soundwaves with broken vocal fragments which provide an unhappy ending. Don't be afraid of Sudden Dark; it's a beautiful collection of truly ambient soundscapes." "Mike Griffin has finally seen fit to bless his own record label with a release of his own solo material. Of course, he contributed a great deal to the Viridian Sun release a few months back, but this time around he is the sole producer of the ambient warbling that graces 'Sudden Dark.' For the most part, all of the material on this release consists of dark ambient drones, whorls, atmospheres and other oddities. Each piece envelops the listener with its complex and thickly woven strings and bass. While 'Sudden Dark' should appeal to ambient and drone fans alike, it should also appeal to those fans of some of the more New Age artists like Steve Roach, Jeff Greinke or Vidna Obmana due to the similarity of compositional style, texture, tone and depth. Overall, one achieves a very serene and surreal mood from listening to this release and that alone is sufficient reason to acquire it, simply as a musical device to relieve the daily stresses we are all placed under." 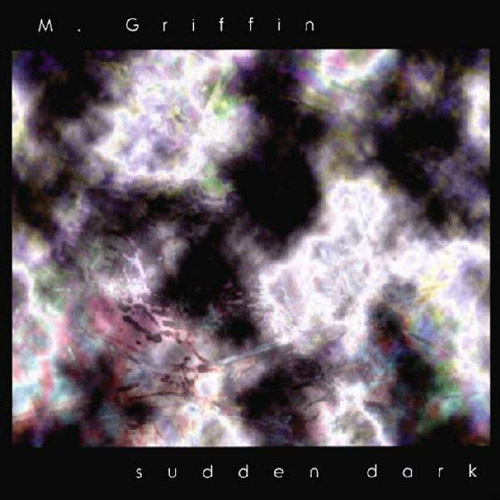 "M. Griffin's Sudden Dark belongs in my 'Not for the Faint-Hearted' category. ....uncompromisingly abstract .... ambient at its extreme, detached from our common ideas of "music" as we usually hear it. Almost the whole album consists of pieces in low, soft tones; the dynamic range of loudness and softness is almost irrelevant here. There is, for the main part, no rhythm -- just hovering, brooding sustained notes. The most notable changes are in texture, more than in the conventional musical structures of pitch and rhythm. The label "dark ambient" is perfect for Griffin's work here. Mood is everything, and throughout the album he creates a floating aura of desolation and menace.... He is at his best when he lets the tones float in layers of roaring and "phasing" textures....if you enjoy spooky trips into a land of fear, pathlessness, and shadows, then M. Griffin's album is just the thing you want." "Hypnos owner hits the spot with his first solo effort. The beautiful CD cover and title give a promise of what the listener can expect: 10 tracks in all which head for darker (but also some lighter) nether regions... Vast atmospheric realms... a world where dream and reality seem to shift, and where the listener witnesses a variety of perspectives. Sometimes seemingly overwhelming, this dark-ambient chill-out is constructed with outstanding audio & mastering quality."